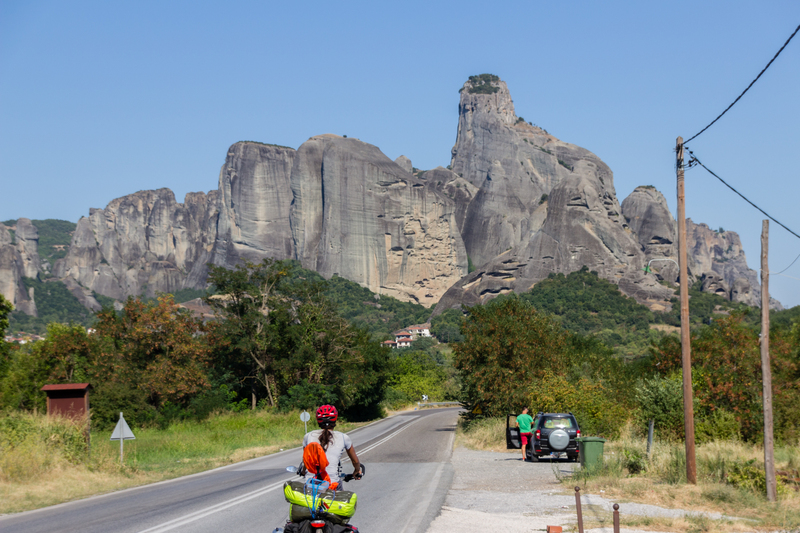 Cycling around the corner towards Meteora, our mouths dropped to the floor as an endless stream of long, dark, pebbled rock pillars, some hundreds of meters wide, stood before us. As we continued on, more and more pillars were revealed until we felt like dwarfs in a time when giants ruled. With such long pillars rising up to an infinite blue sky, it is easy to see why the monks here might feel closer to their God. 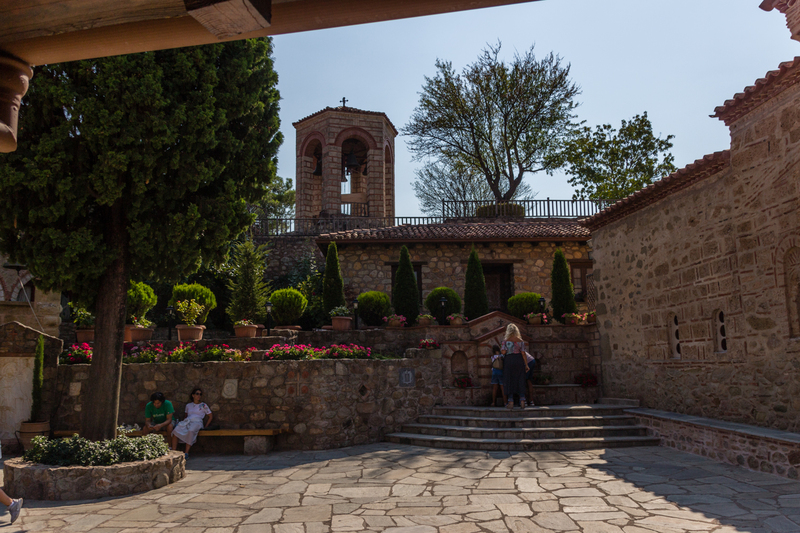 Meteora has many Greek Orthodox monasteries built at the top of some of these majestic pillars – the original old stone ones with its ruins still laying in the rock or the 19th century ones, which still houses monks today. It is a unique place of wonder for all, with its very localised formation and distinct black waterlines still puzzling geologists today. Tanya’s theory is that it is a large landfill site for giant aliens to come and drop piles of waste. Monasteries on top of the pillars. At first, we stayed at a campsite closer to the rocks where we hired a very old caravan that was permanently parked for a reason… but it was still comfortable for us. However the owners of the campsite were not so pleasant. They complained all the time about everything, including tourists?? So we decided to move to another campsite called Vrachos, which had much better facilities and a happier atmosphere. 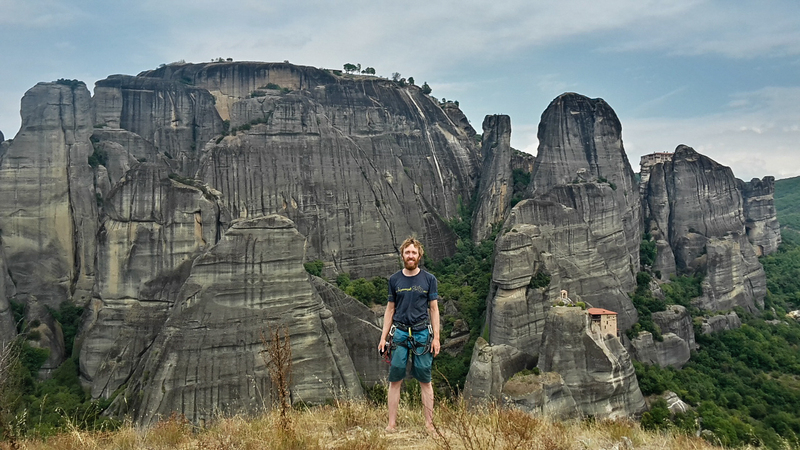 Hiking around Meteora, we stumbled across very old forests with large trees, a massive Dragon’s cave, a prison made for monks that was built into a natural cave high above and many, many turtles. We visited monasteries and had fun getting lost between the pillars. Visiting the Monastery of the Great Meteoron. The climbing in Metora was ‘interesting’ to say the least. The rock was completely different – lots of pebbles mixed together with solid rock. Some layers of rock had big boulders and as you climb up, the layers change along with the size of the pebbles. It is ‘slabby’, but a nicer kind of slabby ;). Most lines are multipitch but there is some sport climbing around if you really want it. The philosophy of the climbing here seems to be ‘adventurous’, so bring a strong head along with your rope and harness. The distances between the bolts are long (sometimes more than 10m) and the idea is ‘don’t fall, or it’s gonna hurt’. We stuck to comfortable grades and enjoyed the view. Simon writing into the summit register on top of the Holy Ghost Guardian. We did many multipitches during our week there but three of them are especially memorable to us. The first was the on the ‘Holy Ghost Guardian’, which was next to the large and famous ‘Holy Ghost’ wall. It had a fun looking line going straight up and we had a nice view of the impressive Holy Ghost from the top. We also did another climb on the other side where Tanya ended up with a rope burn on her ear?? We went to another rock formation called the Spindel on one of the other afternoons, which looks like it shouldn’t be standing let alone climbable. This gravity-defying rock stood between a number of large walls and was one of our best experiences of climbing in Meteora. An especially beautiful climb was the Gordian Knot – 40 m of interesting climbing with a magnificent view. We climbed this beauty, following the edge of the rock, with panoramic views of the grand walls beside us. As Tanya was getting to the top to meet Simon, the sun popped out from one of the walls to say goodbye before disappearing behind a hill. At the same time, the full silver moon shone bright behind us above the distant walls of Theopatra, which rose up in the small gap between the pillars. We laid down on the summit where swallows playfully swirled around, engulfing us in a mini tornado, while we sat, calm, in the eye of the storm. It was a magical moment you catch once in a lifetime, if you are lucky. The ‘Spindel’ is the small sharp rock needle in the middle of the picture. 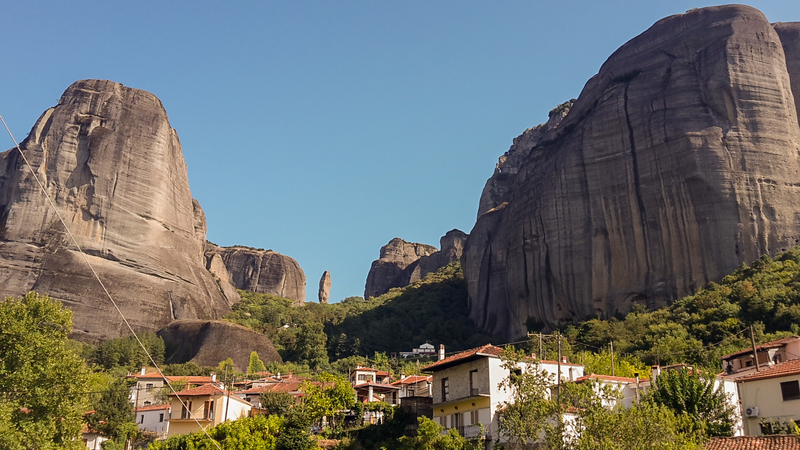 We said goodbye to Meteora by climbing ‘The Pillar of Dreams’ on the ‘Holy Ghost’. 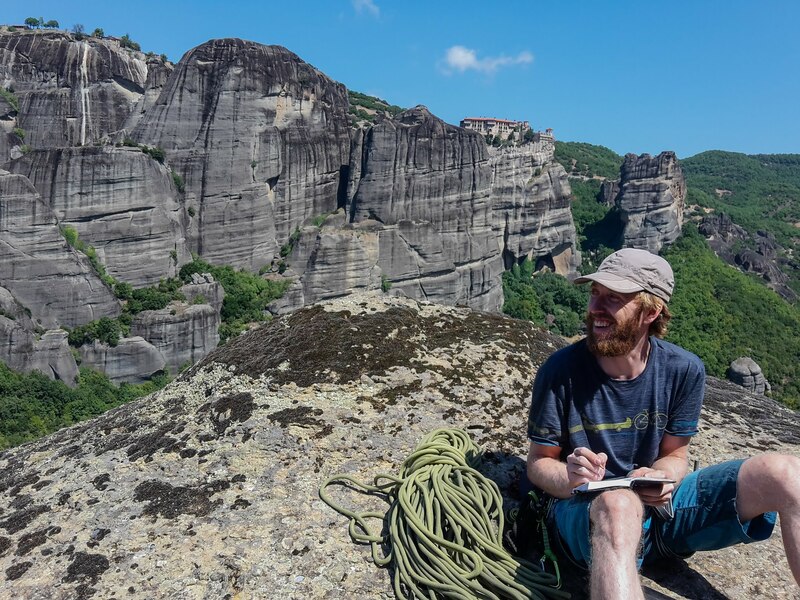 The title of this 250 m climb says it all – it has amazing views of the monasteries and pillars and is one of the most famous climbs in Meteora. We needed trad gear to do the route but Simon was seriously considering doing it without gear. We found Vangelis a well-known climbing local and the expert in the area and told him our plans. He said that was a bad idea and instead kindly lend us his personal trad set! Thank you Vangelis! We were very happy to have the trad gear on the climb. Before the final pitch, we were happy to find a flat ledge at the belay station and decided to have a picnic on the wall and enjoy these other-worldly views one last time. One of the monasteries rang out a tune and serenaded us while we ate. It was the perfect send-off from this magical place. Enjoying the views from the ‘Pillar of Dreams’. 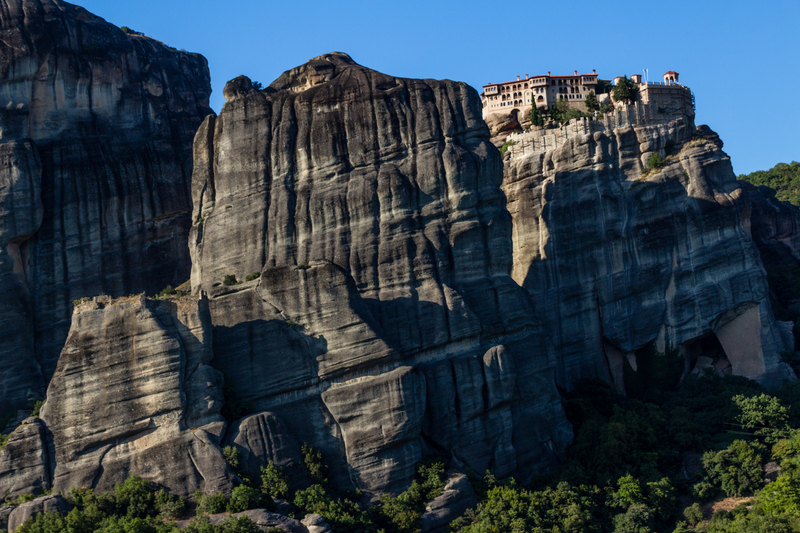 More photos from Meteora and the rest of Greece will come soon. 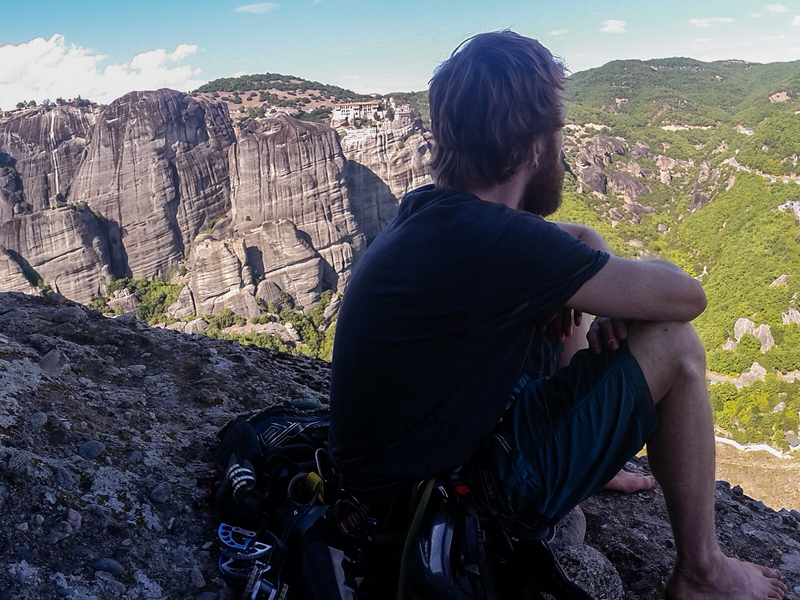 Next we adventure to climbing crags in central Greece and journey to Athens. To get updates from our trip, subscribe!